AMSR-E/Aqua root zone soil moisture (LPRM) L3 1 day 25 km x 25 km descending and 2-Layer Palmer Water Balance Model V001 is a Level 3 (gridded) root zone soil moisture product. It is derived via the assimilation of Land Parameter Retrieval Model (LPRM)/Advanced Microwave Scanning Radiometer-Earth Observing System (AMSR-E)/NASA EOS Aqua surface soil moisture retrievals into the 2-Layer Palmer Water Balance Model, using a 1-dimensional, 30-member Ensemble Kalman filter (EnKF). The 2-Layer Palmer Water Balance Model was forced with meteorological forcing data obtained from the Air Force Weather Agency (AFWA). 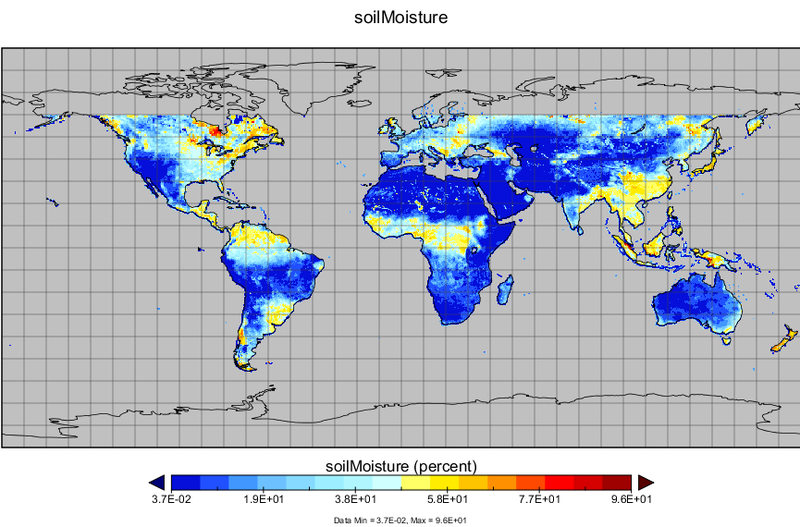 The EnKF seeks to (1) optimally combine soil moisture information derived from model forecast and satellite retrieval and (2) vertically extrapolate surface soil moisture retrievals into deeper root zone soil moisture predictions. There is one file per day (nighttime). The data set covers the period from June 2002 to December 2010. The accuracy of the EnKF root zone soil moisture (RZSM) predictions depends on (1) the magnitude of errors in the model forecasts and satellite surface soil moisture retrievals from which the RZSM is derived, (2) the quality of error information provided to the EnKF (and used to optimally weigh conflicting information obtained from various sources), and (3) the vertical accuracy of the model (used as the basis for extrapolating surface soil moisture measurements to constrain soil moisture at greater vertical depths). Validation results suggest that the EnKF generally provides a more accurate RZSM prediction, compared with the baseline 2-Layer Palmer Model predictions (particularly in sparsely-vegetated and/or data-poor regions of the world). The GES-DISC Interactive Online Visualization ANd aNalysis Interface (Giovanni) is a web-based tool that allows users to interactively visualize and analyze data.